The tiger is one of the largest of the "big cats". It is the only striped cat, and the pattern and distribution of its stripes is unique to each tiger. The main reason for tiger population decline are hunting and illegal poaching due to a strong demand in tiger skins, bones and teeth. Habitat loss is severely threatening its survival too, also increasing the decline in its natural prey species. 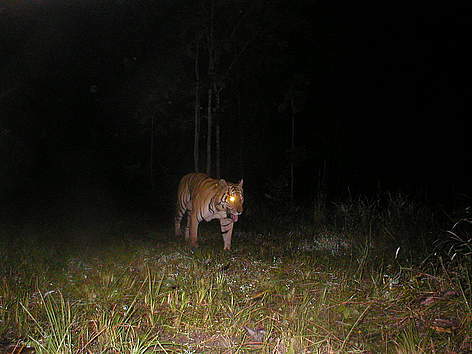 In Cambodia, the last tiger seen was in 2007. However, the country's importance for global tiger recovery is extremely high: according to tiger experts, perhaps the highest potential landscape in Asia to recover tiger populations. Get to know Cambodian poacher-turned-ranger Lean Kha and his work to protect tiger with WWF. Find out more about WWF's global tiger-campaign.